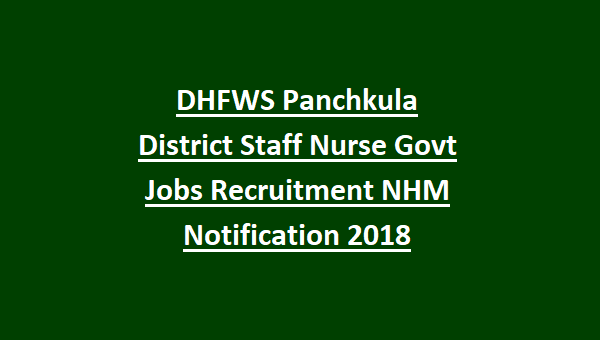 this NHM DHFWS Panchkula Recruitment 2018. Candidates selection for this DHFWS Panchkula District Staff Nurse vacancies will be on basis of Screening test and interview, documents verification. Candidates who qualification B.Sc Nursing or GNM Diploma they can submit application form before the closing date of 16-8-2018. Application form is available for download at www.nrhmharyana.gov.in website. 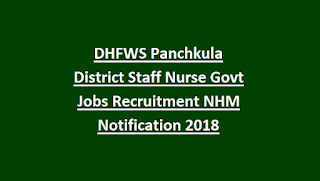 Details information about these DHFWS Panchkula District Staff Nurse vacancies, interview date, age limits, qualification are given below. There are total 19 posts in this NHM Panchkula District recruitment 2018. Candidates must have qualified B.Sc Nursing or GNM Diploma for applying these DHFWS Panchkula vacancies of Staff Nurse. Must have registered with Nursing Council of Haryana. Should have Hindi/Sanskrit up to 10th class. For all the posts upper age limit is 42 years. Candidates selection is based on written exam or screening test and interview, documents verification. Written exam or Screening test will be conducted to know the candidates Subject knowledge . Selected candidates will receive monthly salary of Rs.13500/-. Candidates who are having required qualification they can submit application form in a prescribed format along with all the supporting documents. Candidate can download application form from the official website of www.nrhmharyana.gov.in.